“Buy A Bag” – this is what the button used to do. You can also click on the first empty bag slot in the footer (marked with a ZEN icon). “Identify All” – Yay, finally! Goes to every unidentified item in your inventory, starting at the top of the grid, applies the most appropriate identify scroll to it, and moves on to the next unidentified item. This continues until you run out of unidentified items or scrolls, whichever comes first. If you have items that you want to make sure get identified, move them to the top of your inventory! “Sort All Bags” –Using this option rearranges items over all your bags so that all items of the same type are grouped together, no matter which bag they were in. You can’t quickly undo this, so use with caution! The difference between this and the “Sort” button next to the individual bags is that with the individual bags’ “Sort” button, only the items in that bag will be rearranged. “Sell All Treasure” – If you’re at a place where you can sell items, this will sell everything of category “Treasure” in your inventory. 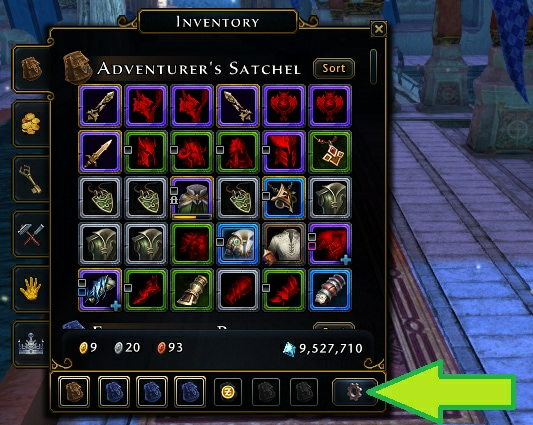 You can see on an item’s tooltip if it has this category, at the bottom left. Examples of treasure are things like Priceless Platinum Bowls, Jeweled Platinum Statuettes, Intricate Bone Pins, etc. 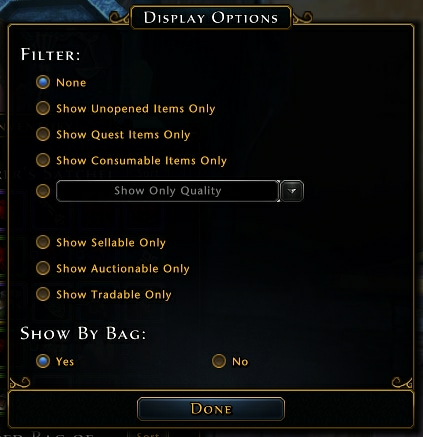 “Display Options” – This is a way to filter your inventory display to make it easier to find items. Selecting different filters will show only items with that property. Any filters being applied will appear at the top of the inventory window, to reassure you that your inventory hasn’t actually changed. 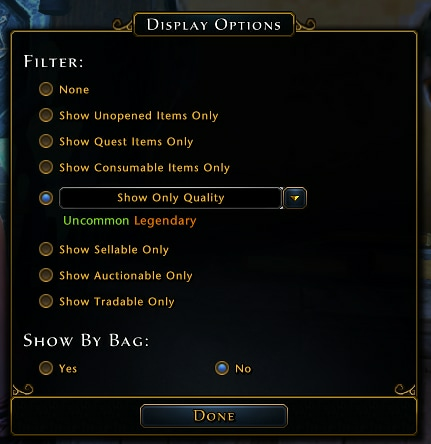 As an example, here is a display choice to show only items of qualities “Uncommon” and “Legendary,” and to not show the inventory divided up into bags. All items will be shown in one big grid. And here is the resulting inventory display. Your choices here will be remembered between game sessions, so the next time you log in you’ll still see this filtered display. “Convert Refinement Points” – This is a way to do a bulk conversion of items to Refinement Points. There will be another blog post about the whole refinement system, so I won’t go into how or why you’d do this. 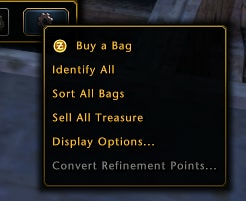 Just be aware that there’s a way to convert a bunch of items to RP all at once, as well as converting items individually through their right-click menus. We’re really hoping that these changes can improve the quality of life for our players. We are always looking for ways that we can make the user experience more enjoyable. What do you think? 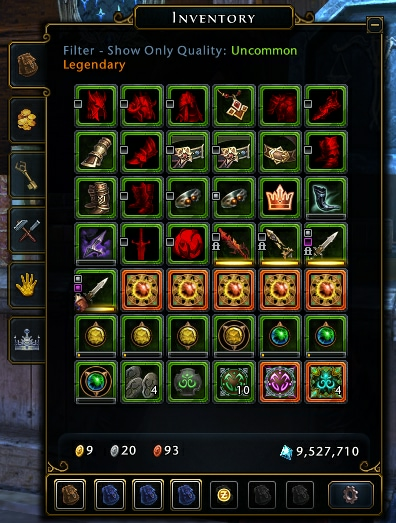 Are there any other inventory features that you’d like to see? Discuss Dev Blog on official forum thread!